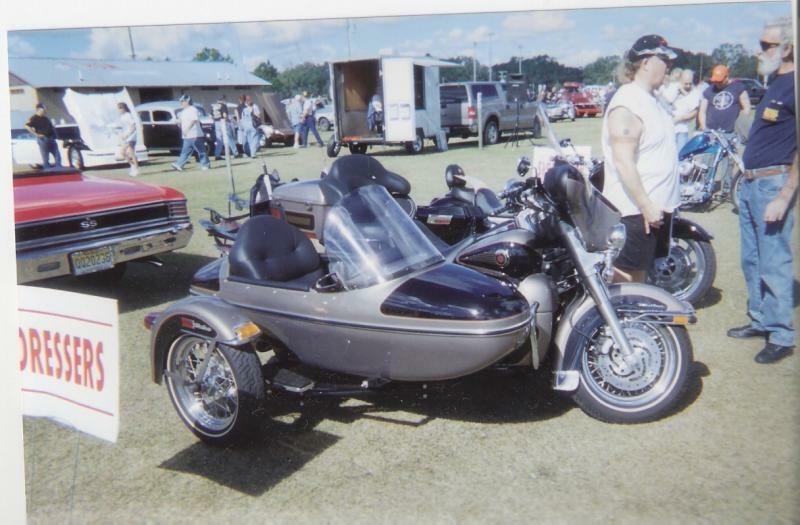 This is a Sweet Sidecar made by Johnny Sweet. It was also pulling this trailer. The owner is the man in the picture. A real nice guy! 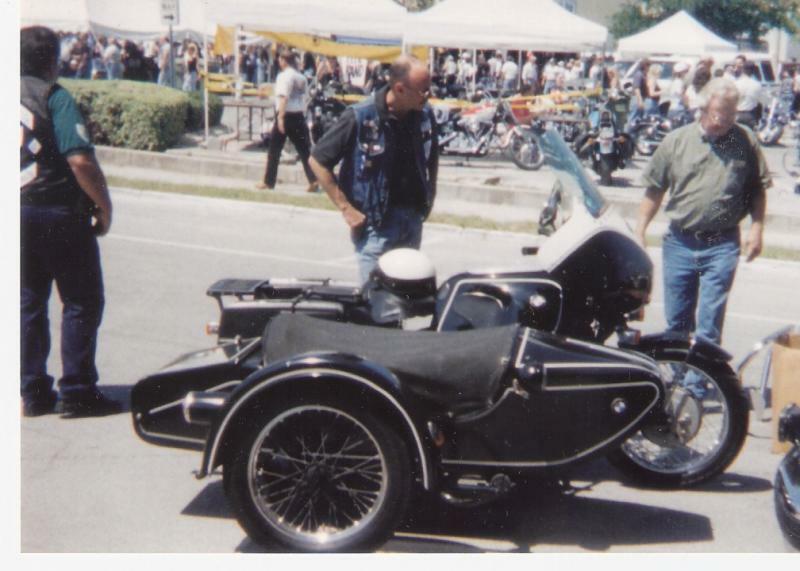 A new Victory Motorcycle with a Motorvation Roadster Royale Sidecar. 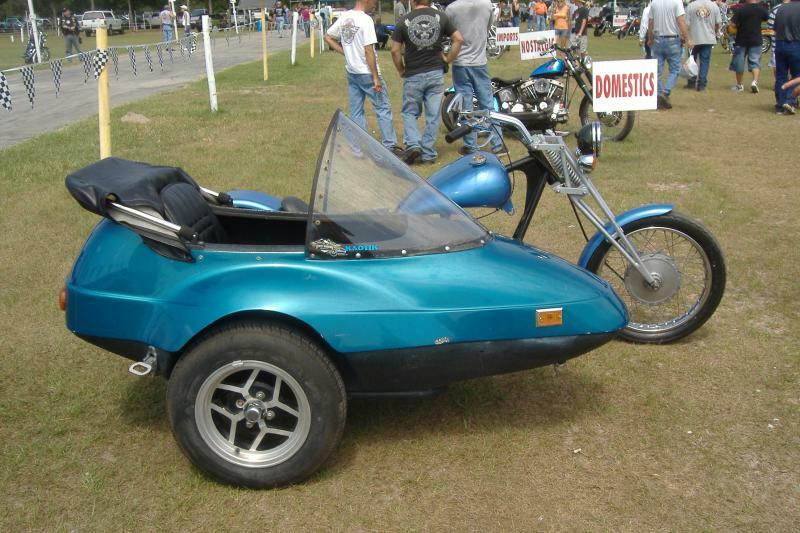 This looked like a home made sidecar. No one was around to ask about it. 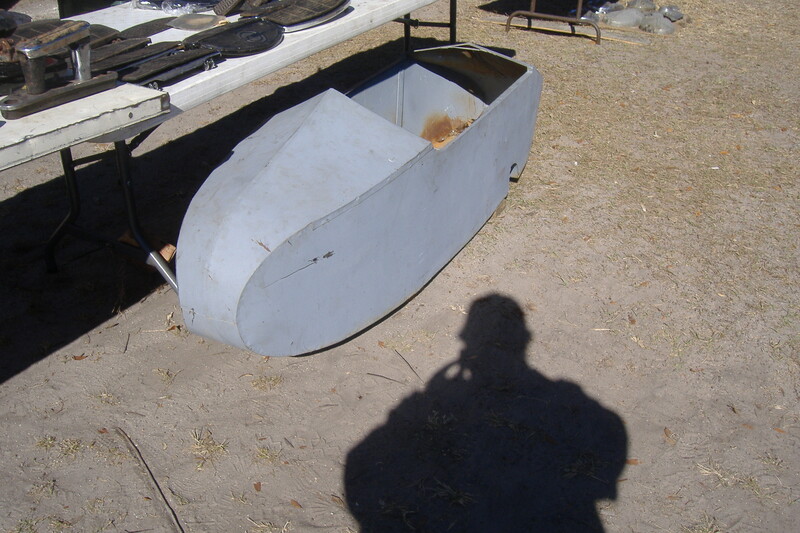 Sidecar trunk area in rear. 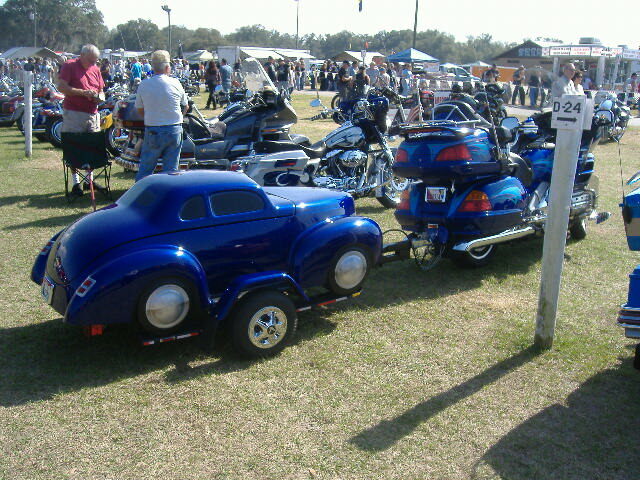 Some sidecar pictures I took at the February 5-2012 Webster Florida motorcycle swap meet. 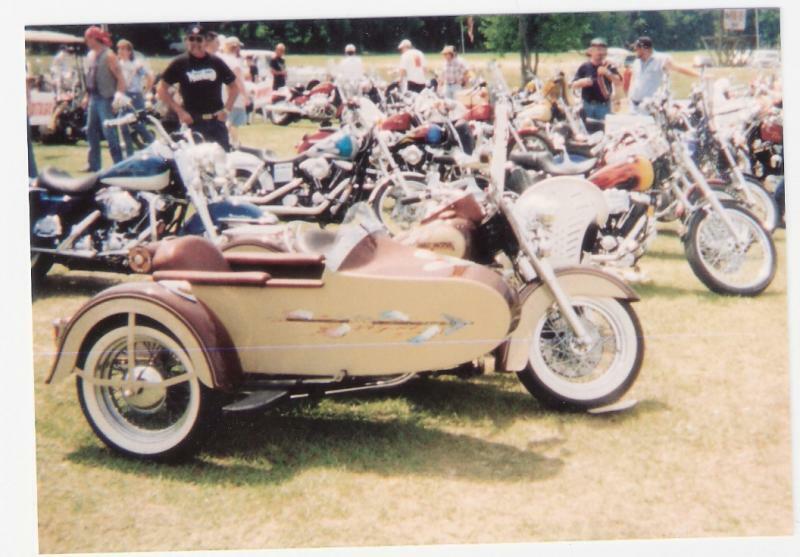 Hannigan Sidecar Harley-Davidson Peanut Sidecar Harley-Davidson Peanut Sidecar with side door. Woman having lunch in the 84 degree February Florida sun shine. 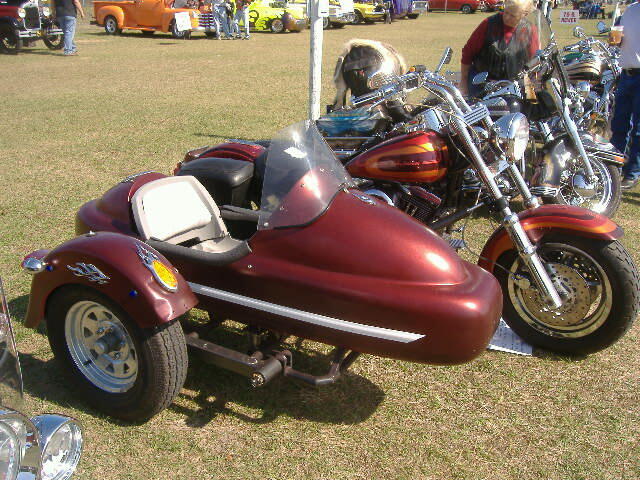 Spirit Of America Eagle Sidecar with stock chrome frame and Cub Cadet lawn mower seat. Lower front "Z" Bar mount is OEM, the other 3 Eagle sidecar mounts are aftermarket. 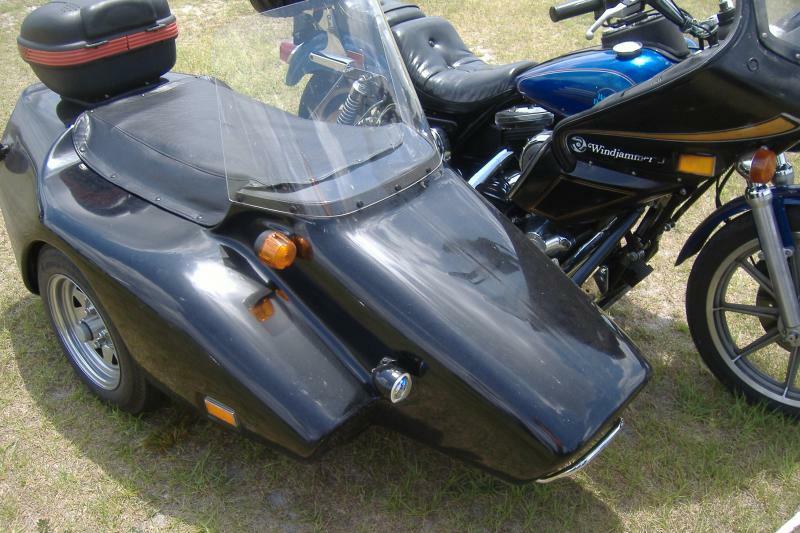 Spirit Of America, Eagle sidecar front upper and two rear mounts, aftermarket. 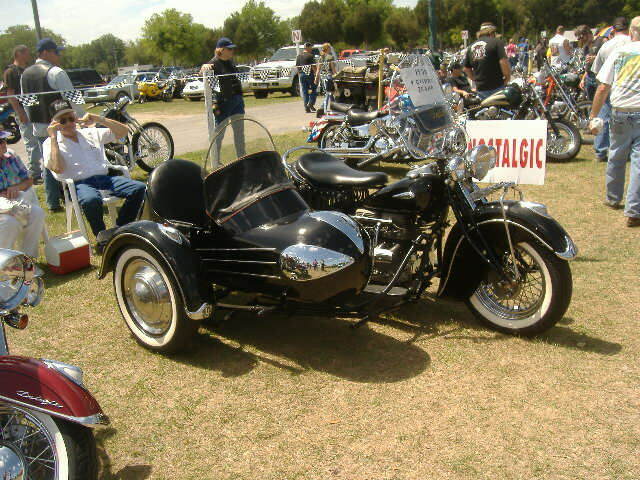 The catseye taillight on the Eagle sidecar is not stock but fit OK.
Dec 7-2008 Webster swap meet.Saw this older Harley Shovelhead with a newer Harley sidecar. Feb 3, 2008. 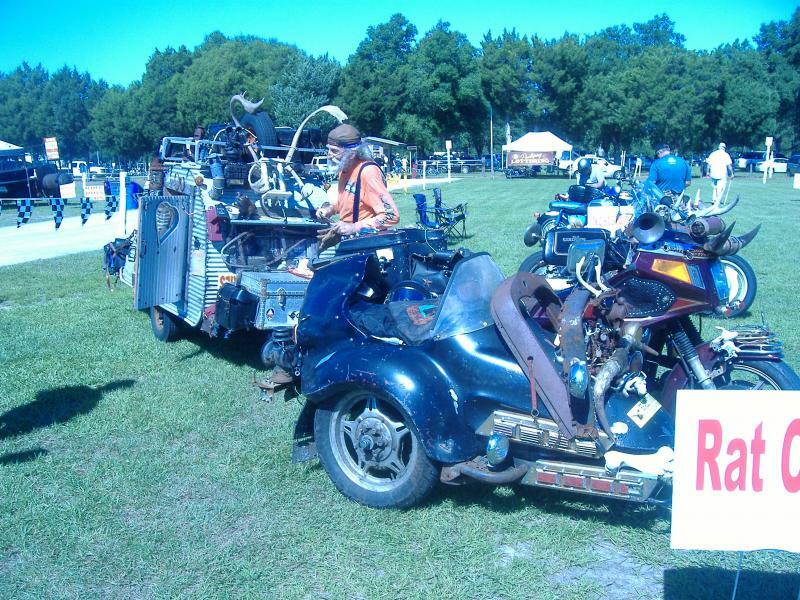 Webster, Florida, Motorcycle swapmeet. 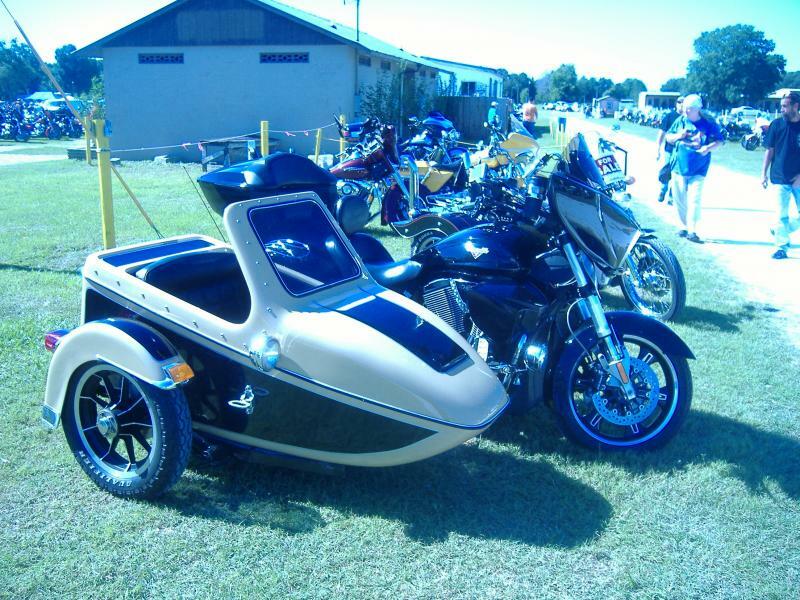 Pictures of some sidecars and a small motorcycle trailer. 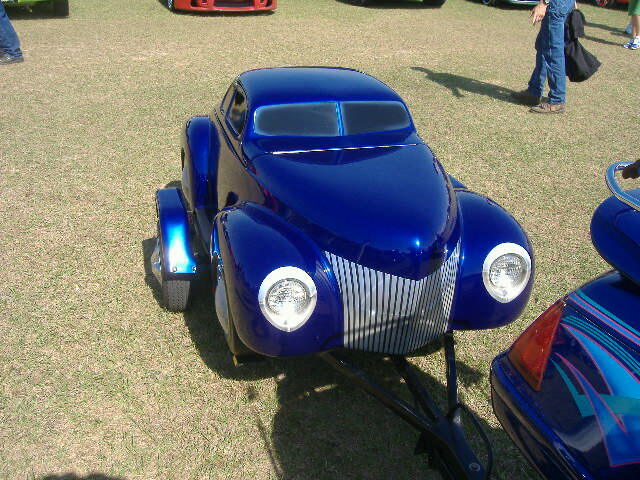 The trunk opens on the blue car for storage. 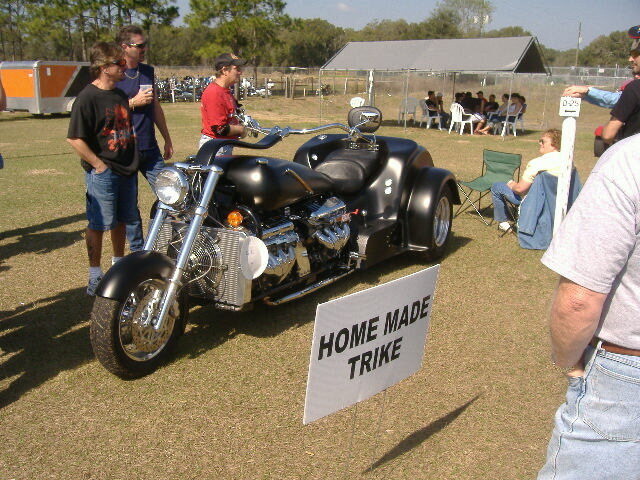 The big trike has two V-8 motors - it was a monster! 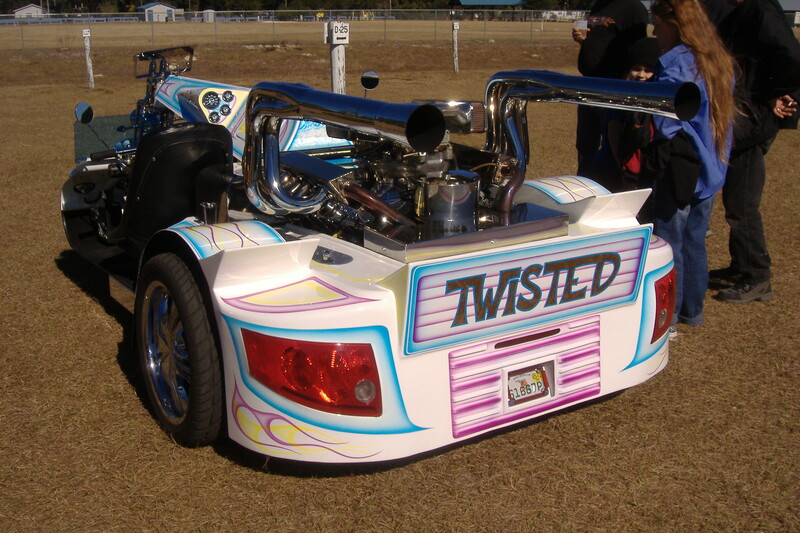 The yellow and blue sidecars with the convertible top up and other down are California Sidecars. 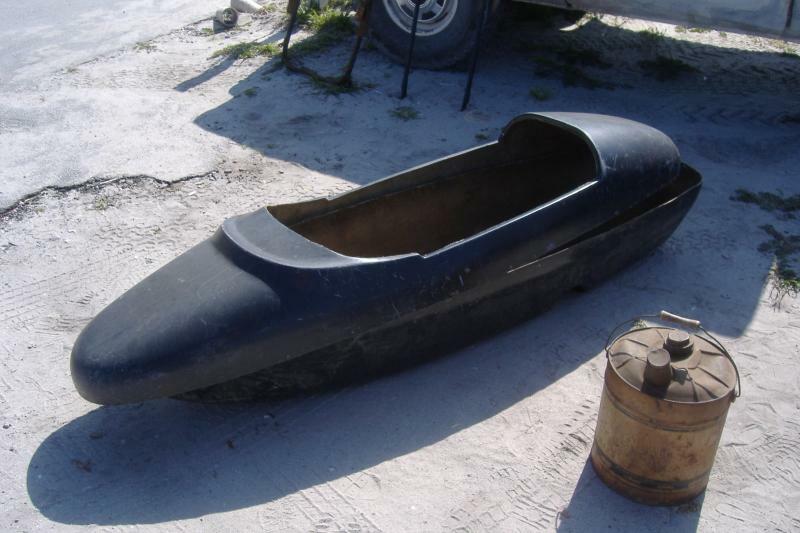 The California Sidecar Company had a fire and lost their sidecar tooling and have since stop manufacturing California Sidecars and stopped making spare parts and giving support for any of their previously built California Sidecars. 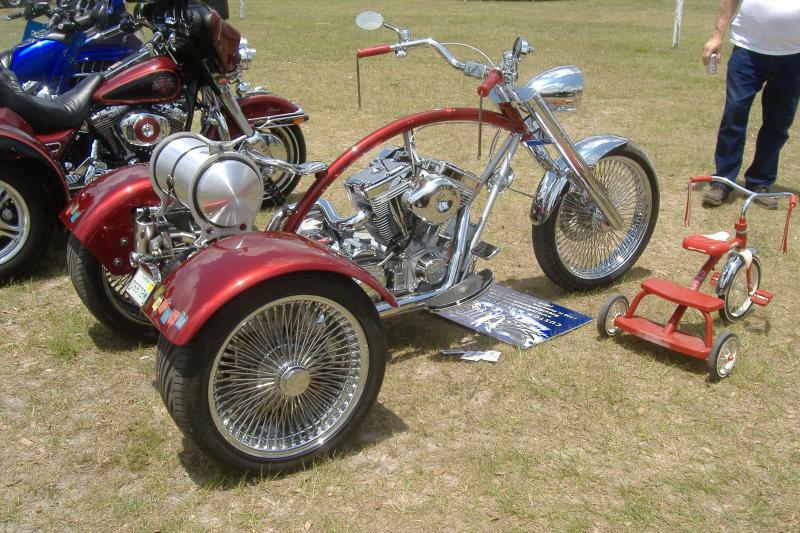 Their reason given is because they had very few new sidecar sales and it was not worth replacing their tooling. 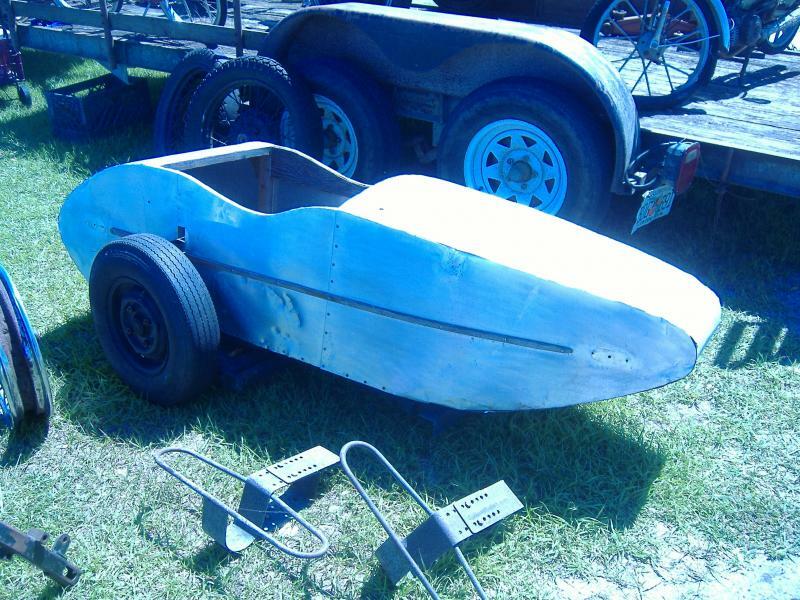 It is too bad because alot of people have California sidecars and need parts, I know because I hear from them when their trying hard to find parts for their California Sidecars. 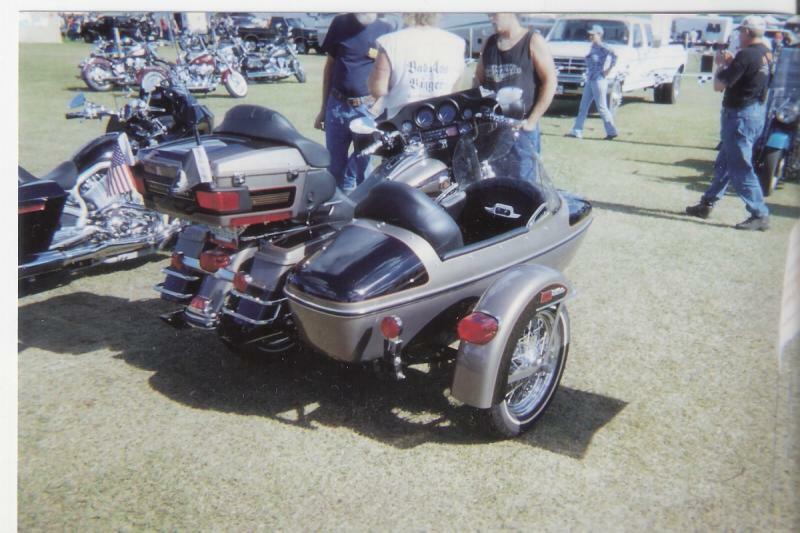 The California Sidecar company is now building trike kits. 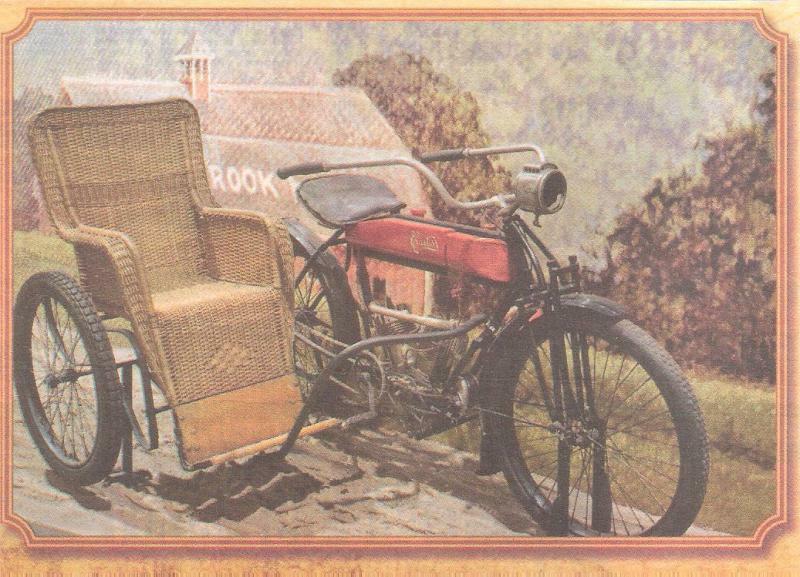 A Goulding Rocket sidecar on a Indian motorcycle. 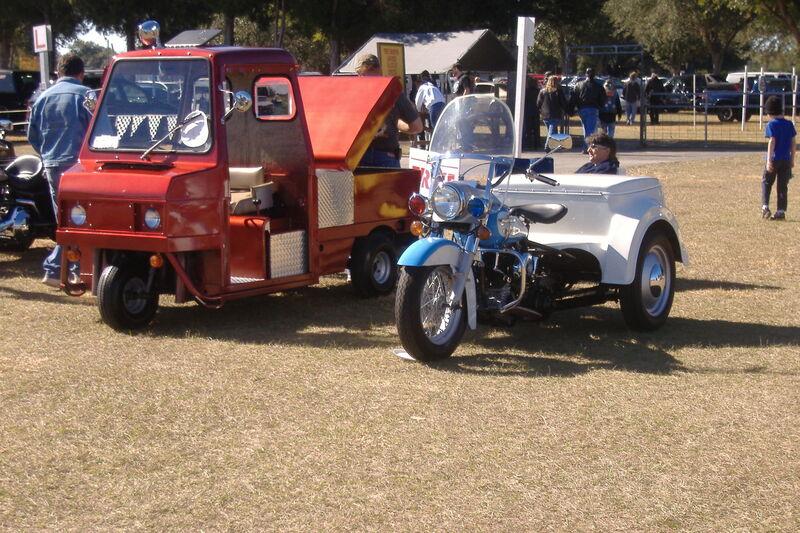 This sidecar was an Indian factory option. 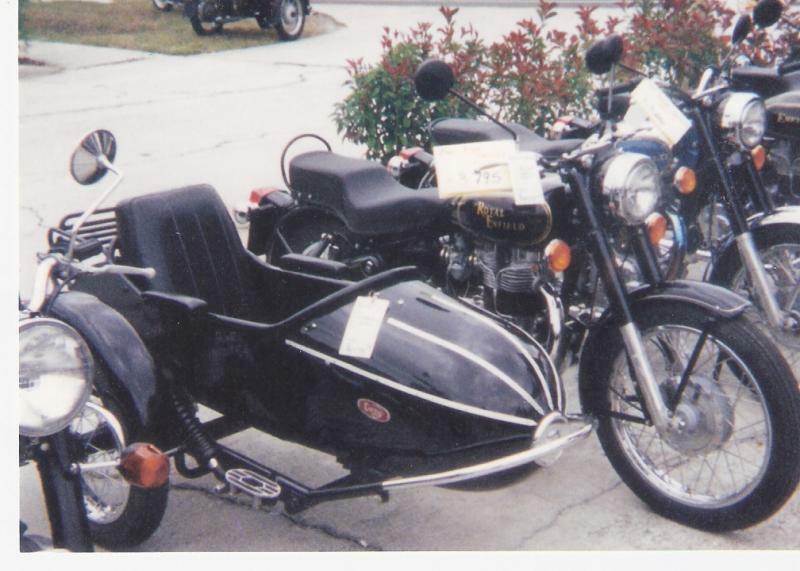 Goulding manufacturing Company made this sidecar in Saginaw Michigan from 1939 to1953. 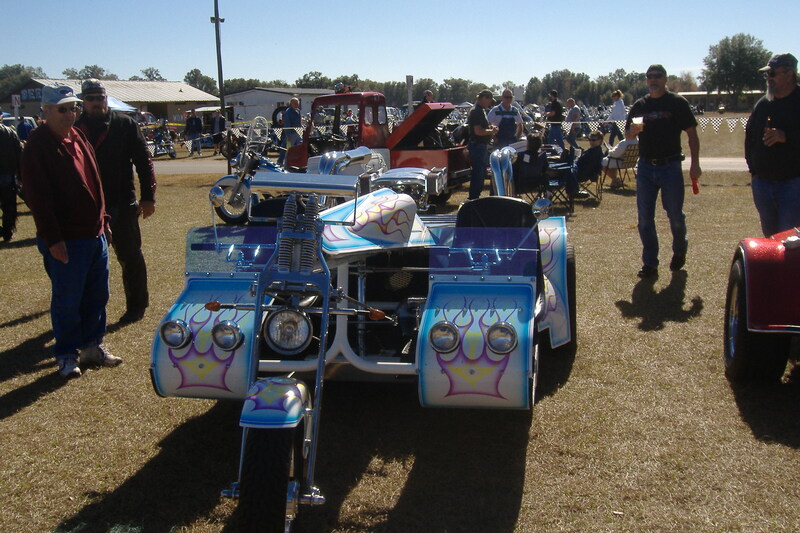 The Rocket, Indian outfit was seen recently at the Webster, Florida swap meet which was entered in the car and bike show held on the first Sunday of every month. This is a great place to find that part you've been looking for or to socialize with other motorcycle enthusiasts. If you're in the area check it out. 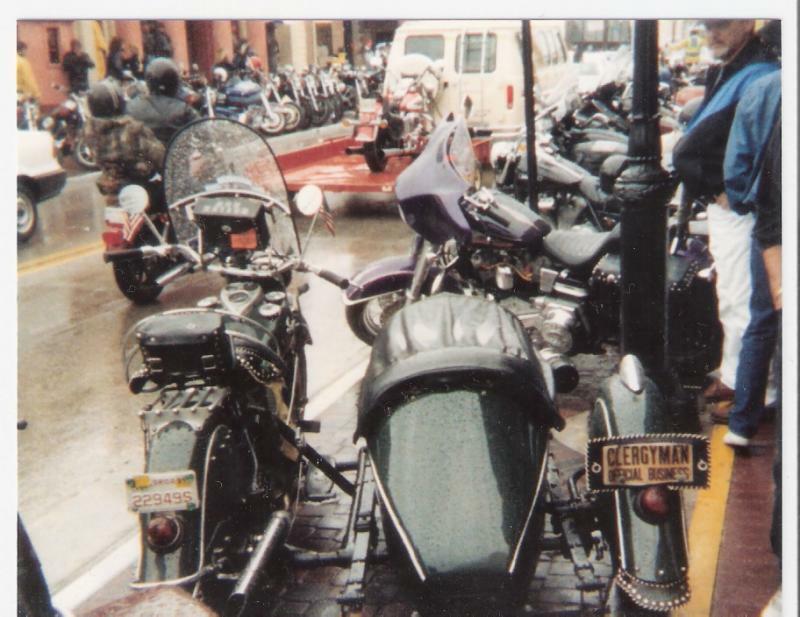 The bottom picture is of an old Indian, Princess sidecar outfit I saw out in the rain at Daytona bike week 1991. 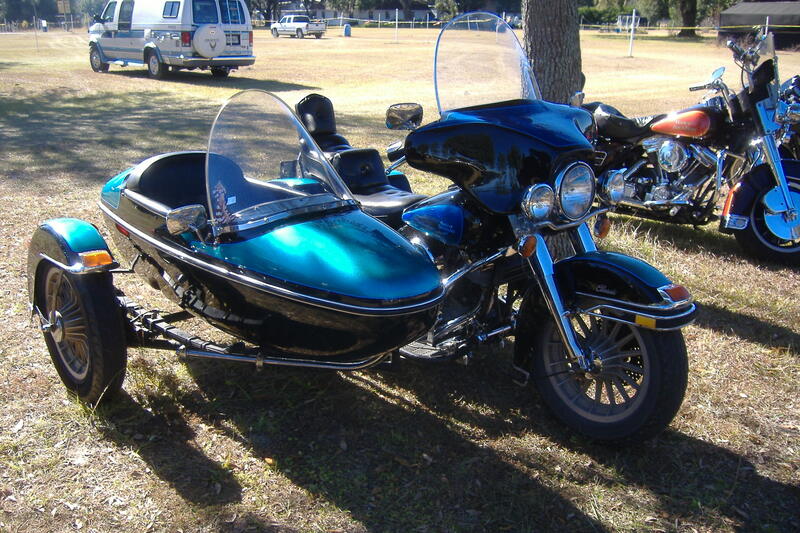 Update: I have been informed by a good friend of the owner that he passed away and the Indian, Princess sidecar outfit has been broken up and sold off separately. What a shame! 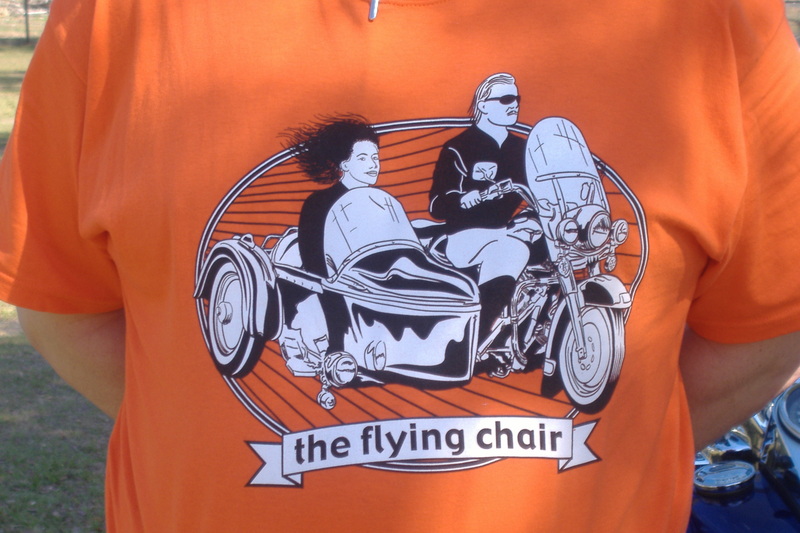 Please Take a look at our sidecar clothes: sidecar t-shirts, embroidered sidecar hats and sidecar bumperstickers. 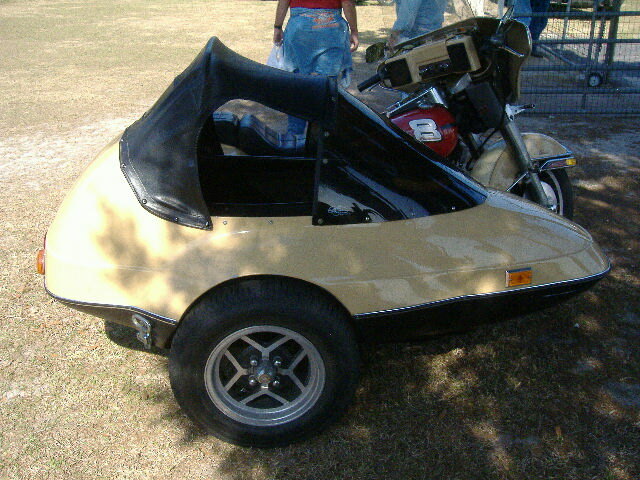 Also from Webster 2-5-12 is this American Easy Rider sidecar body on a home made sidecar frame. 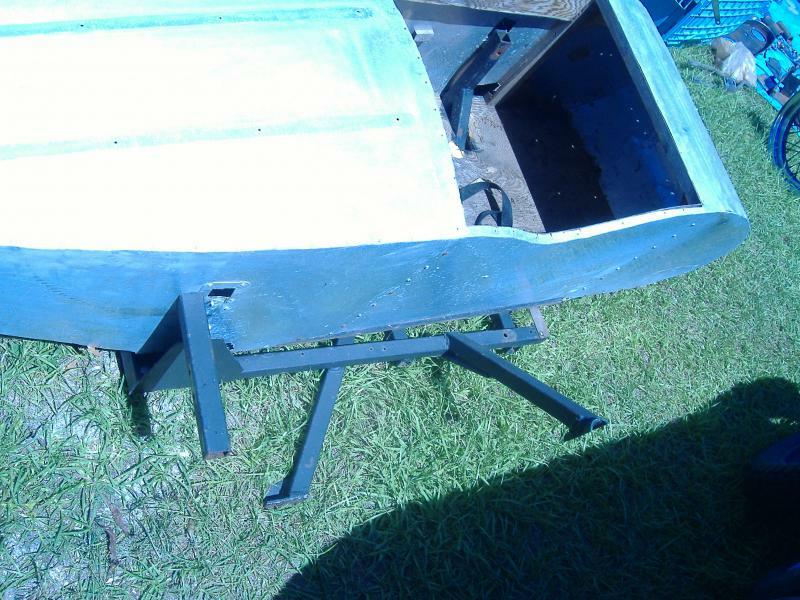 The sidecar body has a new tonneau cover and was very well made! Dec 7-2008 Webster swap meet.This old Harley sidecar body was for sale, the owner wanted $1100.It was in good shape but had some light rust inside trunk floor. 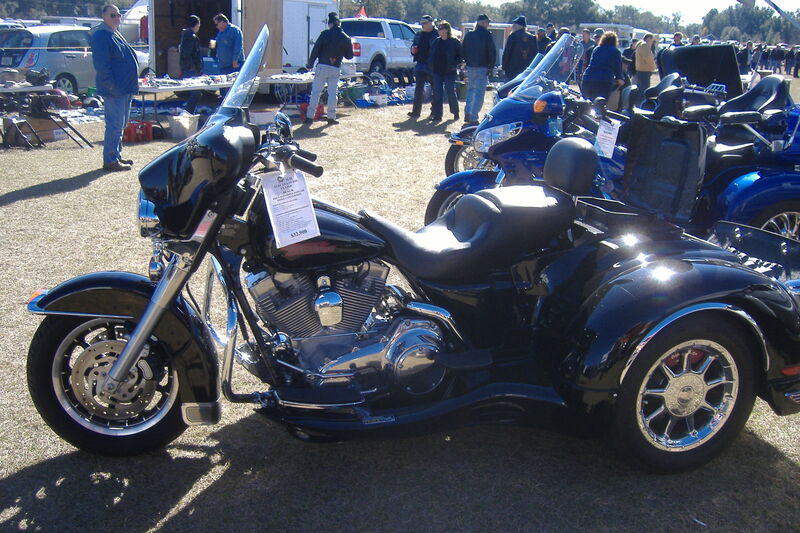 This Harley trike was for sale $32,900.Looked great and had a nice trunk.Webster swap meet. 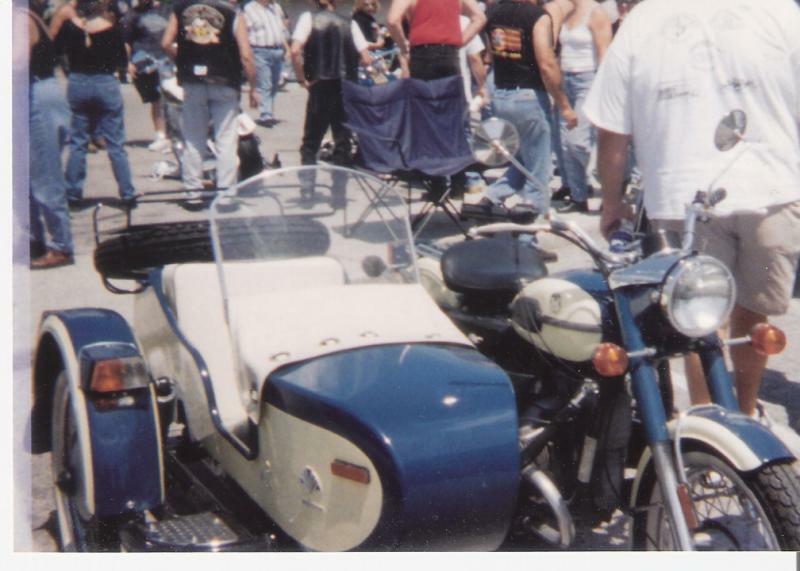 Old Harley Sevi-car in bike show at Webster swap meet. 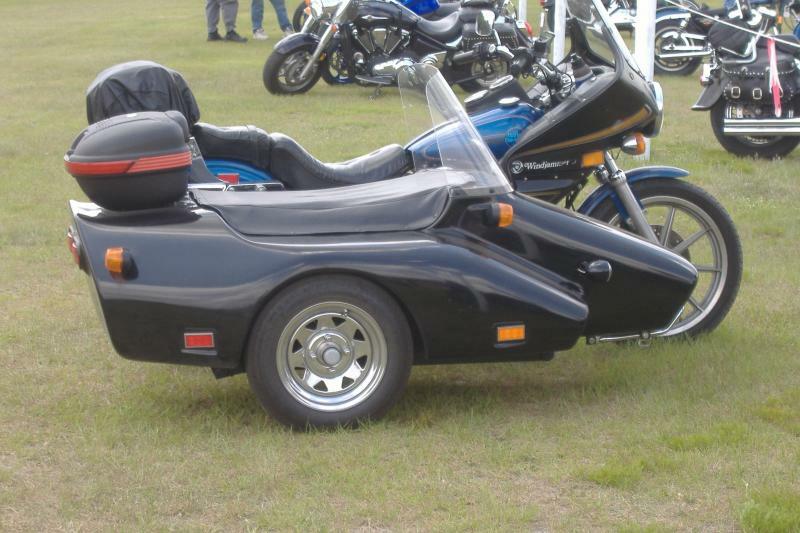 This monster trike has two sets of driving controls.It was in the bike show at webster. 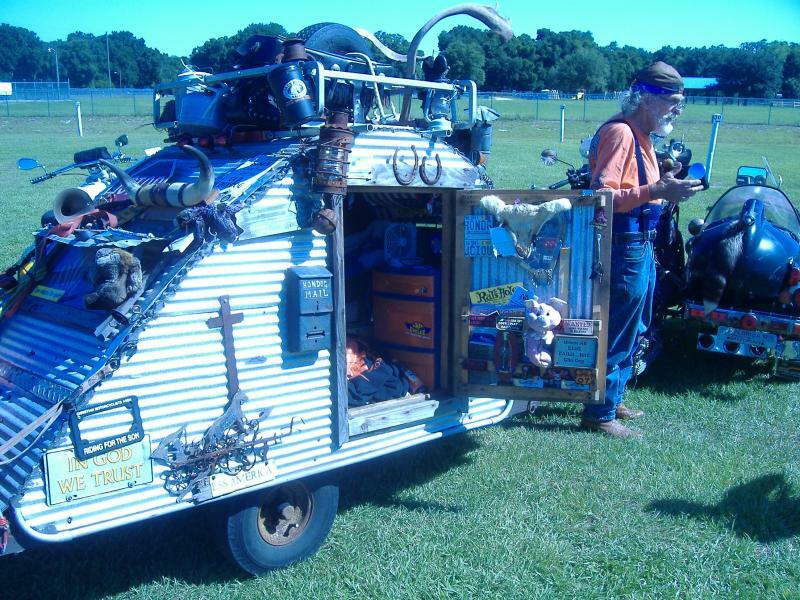 The back of the trike. 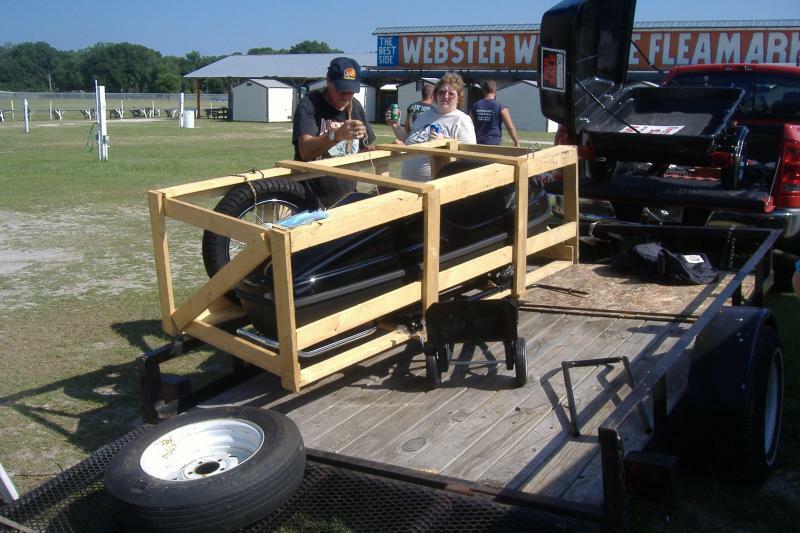 This is the local Tampa Florida, Velorex Sidecar dealer Billy Bob at the Webster swap meet with a new Velorex Sidecar in the shipping crate. 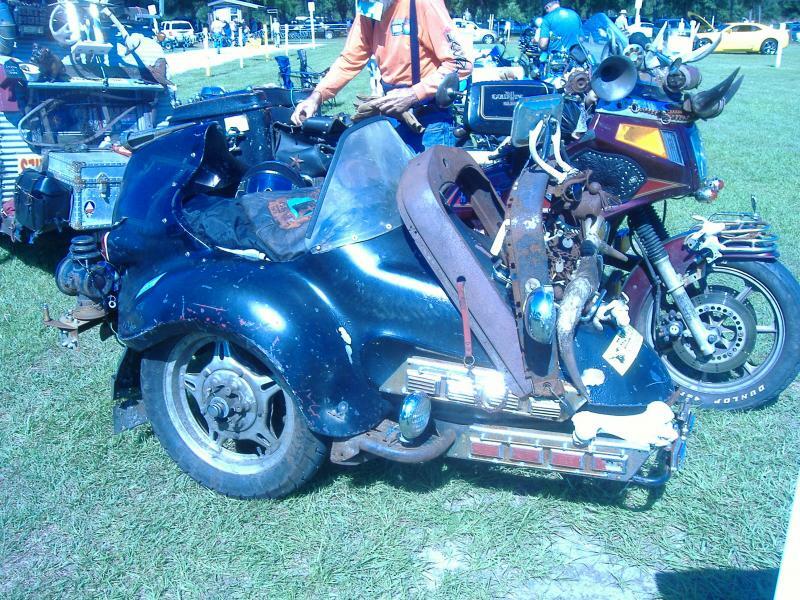 I saw this Harley sidecar body again at Webster Dec 7-2008 and the owner still wants $500 for it.It is in good shape and has never been fasten together.He must not be getting tired of lugging it to the swap meet for the last year that I have seen it. June 1,2008. The pictures above I took at the Webster motorcycle swap meet. 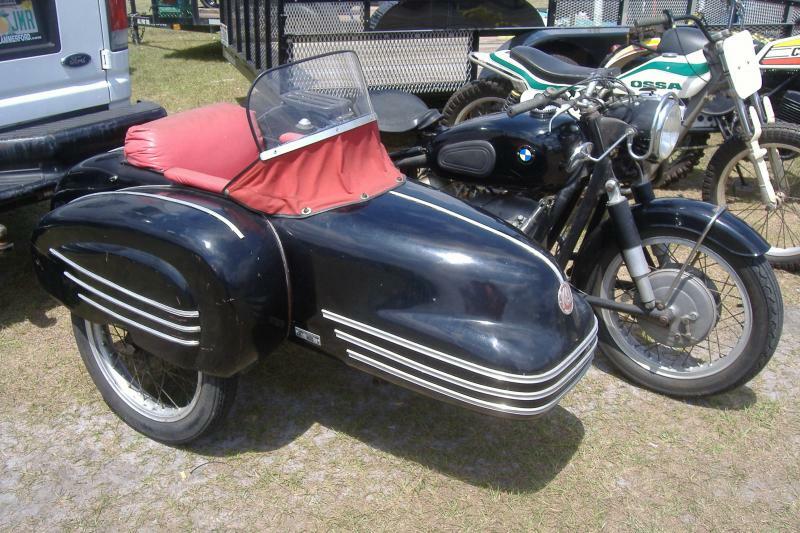 1. is a outfit in the bike show, 2. is a new Velorex for sale still in the shipping crate. 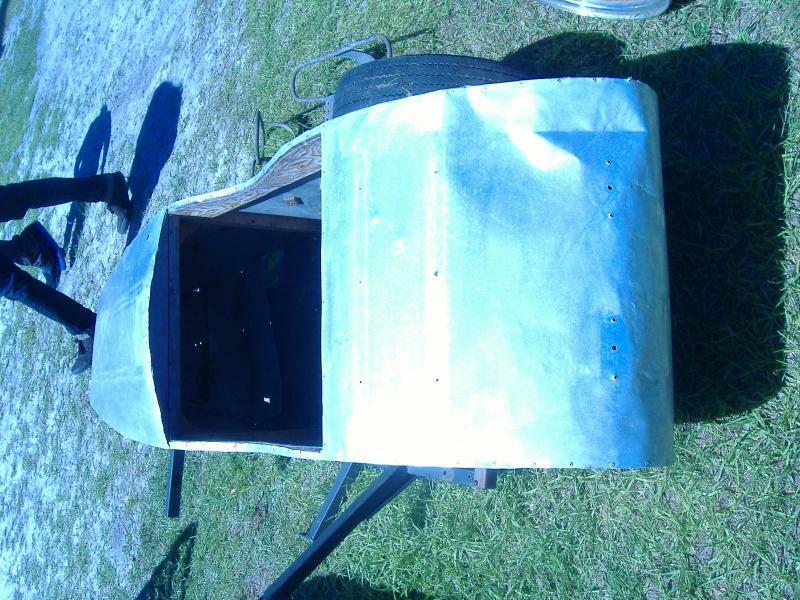 3. is a Harley sidecar body that had never been used, the owner wanted $500. 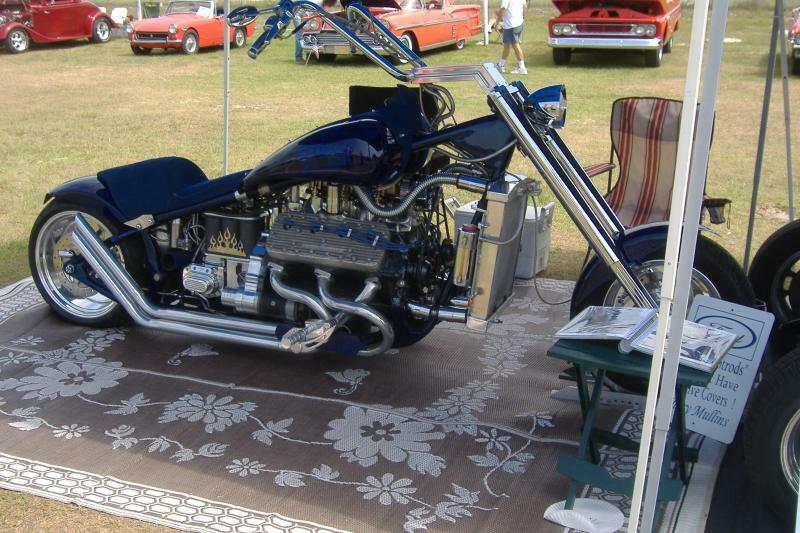 4. is a big flat head v-8 bike. 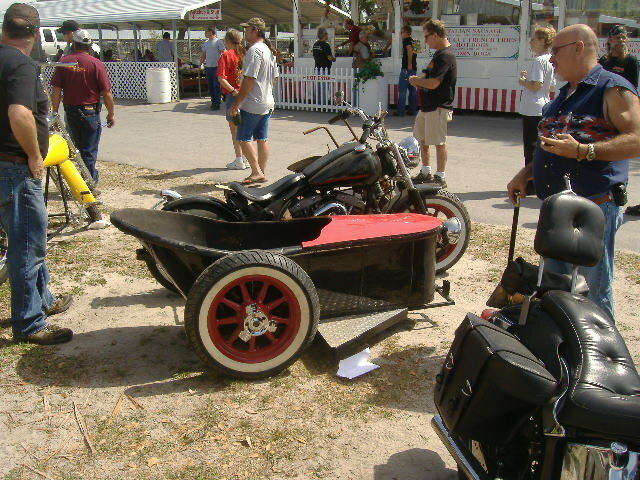 5. is a home made sidecar I saw at Webster last year. 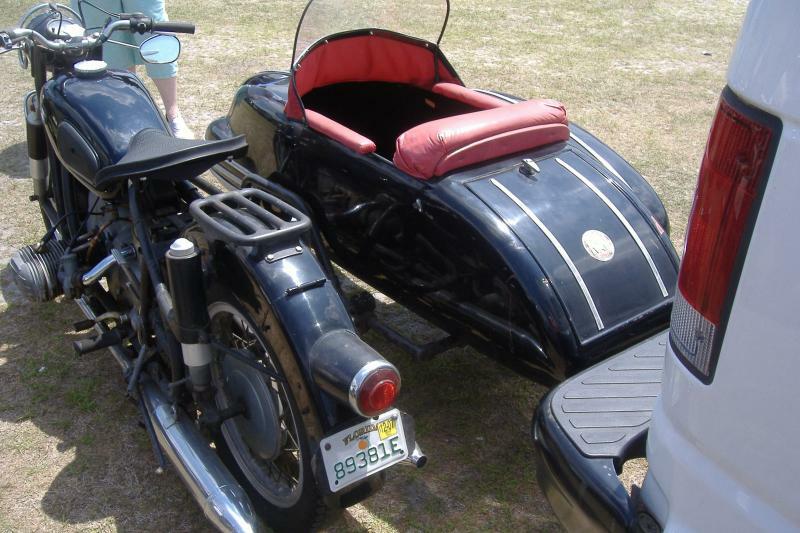 Check out the BMW outfit followed by a Royal Infield Cozy sidecar outfit. 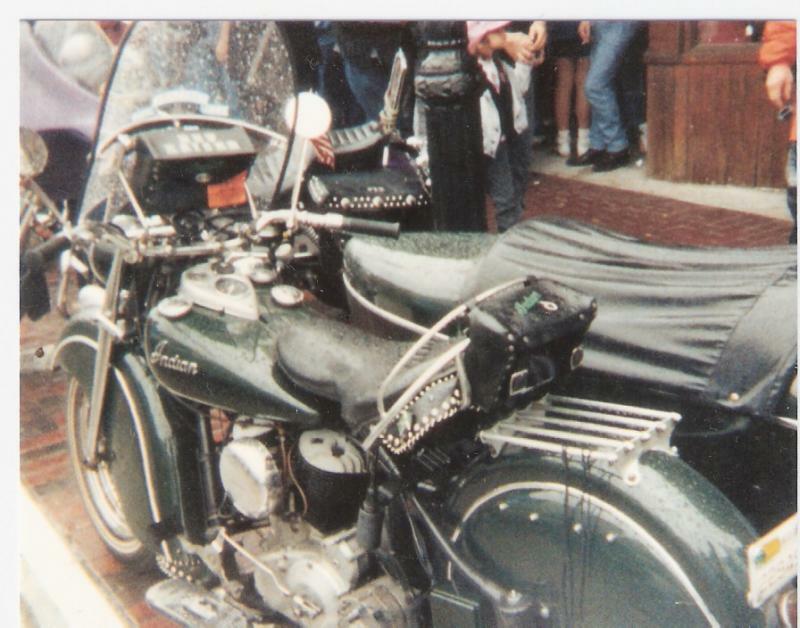 The last pics show the classic Harley Davidson outfit.